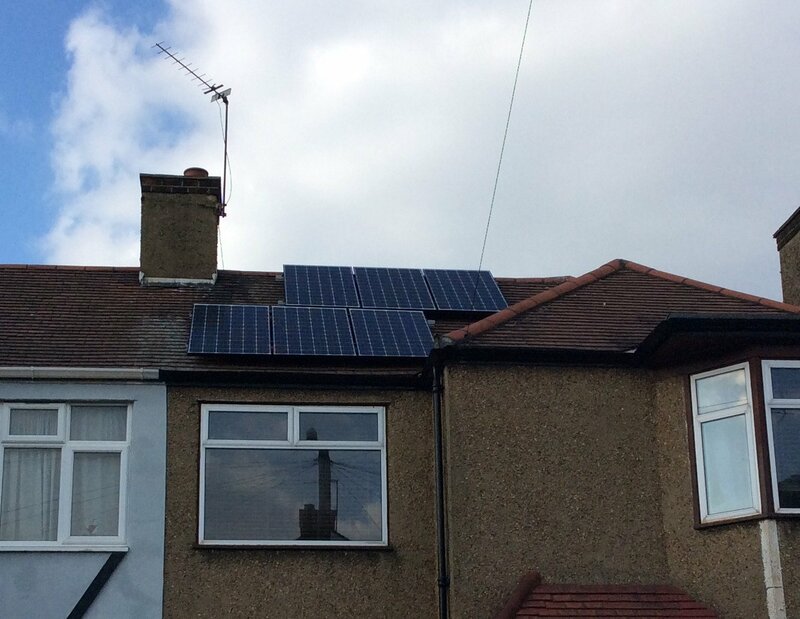 Our house is now equipped with a solar energy generation system fitted by Green Power Home Services in Hainault. We paid an up-front cost for the installation, and are now generating some of the electricity we use, and receiving money both for what we generate and what we import to the national grid. As well as I can piece it together, here's how this works. 6 panels on the front, 5 more on the garage. In our particular case 11 solar photovoltaic panels are fixed to two roofs which face in the right direction and have the right incline. For this part of the world the right direction is south and the right incline is 30 degrees. The roofs with the panels are around 35 degrees from south (one rotated a bit to the east, the other west) and their incline is 40 degrees. There's no shade except clouds and the Queen's fly-by, which is good. 6 panels on the house roof and 5 on the garage roof. Ours have 19.4% efficiency - fairly standard for domestic generation (higher-priced, more efficient panels are available but for the moment they're prohibitively priced for domestic use). The kind of photovoltaic cells (Panasonic HIT) we have is supposed to be efficient even at high temperatures (something to look for). Domestic installations like this have an expected lifetime of 25-30 years. The roof mounting kit - brackets are screwed through the tiles and into the rafters. 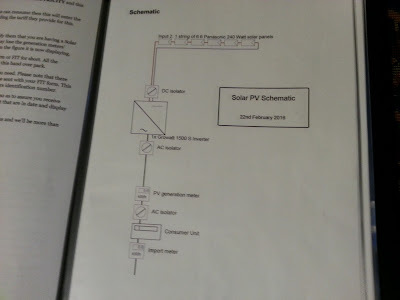 For each array, an inverter to turn the DC power from the panels into an AC current the house can use. 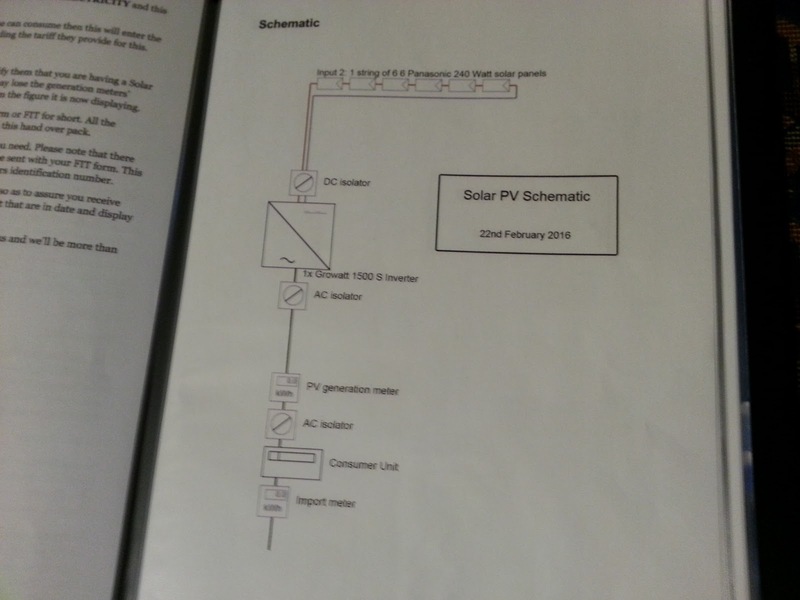 The voltage set on the inverter is higher that the preset voltage from the national grid, which means that during daylight hours our house will use the free solar power first in preference to the electricity we'd have to pay for. One inverter is on the garage wall, the other in the house loft. A meter to monitor the generation - this is the first meter the power passes through and the feed-in tariff we get is based on that figure. A consumer unit aka fuse board which makes the electricity available for use by the electrical circuits in the house. Another meter to monitor how much energy we import to the national grid. This is the energy surplus to what our house consumes, and given that we are away at work for most of the daylight hours, have gas central heating and an energy efficient fridge and freezer, we are likely to be importing the majority of what we generate, for which we will earn payback - more on that below. We paid just under £6000 all in. According to the quote, and in ideal circumstances, for that initial outlay we get 2194kWh (kilowatt hours) of electricity generated per year, untaxed. kWh is the amount of energy you'd use if you kept a 1000 watt appliance running for an hour. Scroll down this page for a table indicating how much some household appliances cost to run. £96.31 annual feed in tariff payment for the 2194kWh - we get that whether we use the energy ourselves or export it to the national grid. £49.36 estimated payback for exported electricity, at a rate of £4.5p per kWh and assuming we export 50% of the electricity (but we may well export more). £164 saved per year on our electricity bill, again assuming we use 50% of what we generate. All of which means that a system like this pays for itself during its lifetime. All you need is to be fortunate enough to have money to pay the up-front cost (there are other ways). Our main motivation, though, was climate change mitigation. The UK's current Conservative government is not supportive here. The EU pledged a 40% reduction by 2030 (based on 1990 levels) dividing the reductions among its states depending on income. Nearly a third of UK emissions come from housing, but the UK is underachieving our renewable energy targets and has dropped many of its climate change mitigation schemes*. And the EU's pledges aren't even considered very ambitious, so really we should be over-achieving them. Meanwhile average UK emissions are estimated at 6.7 tonnes of CO2 per person per year and needs to come down to 2 tonnes. Along with renewable energy generation for those who can afford it, home insulation, transport, purchases and diet are other choices within individuals' control, more or less - the rest is down to the government. Our installation happened in February shortly after Amber Rudd, Climate Secretary of the (cough) "greenest government ever", u-turned government policies on climate change, cut incentives for green domestic energy generation, and even killed off the tool which you could use to calculate your home's energy performance. Thankfully VAT on these energy-saving materials was only 5%. And she was unable to put a dent in our main incentive, which was a habitable climate for the next generation. *How sovereignty can be bad for your kids' health.